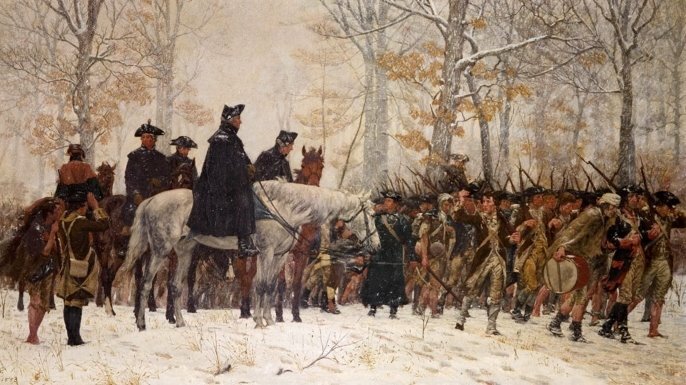 Many think of the Valley Forge encampment with grounds forever covered with heavy snows, where hungry soldiers in tattered clothing huddled in icy huts, where Martha Washington visited among the private soldiers. But do you know what really happened at Valley Forge? Dr. Nancy Loane, noted speaker, author and researcher, will examine the myths and uncover the truths of that famous winter of 1777-78. Join us on Tuesday, April 16th at 5:30 p.m. and discover a Valley Forge that you probably never knew existed. Light hors d’oeuvres will be served, and libations will be flowing! We’re proud to be pouring Yards Brewing Company’s Thomas Jefferson Golden Ale and George Washington Porter for the evening. Dinner will be served as our lecture begins at 6 p.m.
Click here to view the full menu with entrée options. A Q&A session will follow with complimentary coffee and mini desserts. Reservations are required for this event and seating is limited. Don’t wait! We’ll help you make a reservation today at (610) 298-9333.